We love to eat seafood and I prepare it at least twice a week, but for a food blogger with an Italian inclination it doesn’t provide much material to blog about. The Italian kitchen is very diverse with different dishes in each region, but the Italians agree all along the long coastline that as little as possible should be done to seafood. It is usually grilled or pan-fried with olive oil, salt and pepper, and sometimes breadcrumbs, lemon, or parsley. Sometimes fish is cooked with tomatoes, olives, and capers, but the delicate flavor of seafood is easily overpowered that way. And so although we often eat seafood antipasti and secondi, blogging about them would become very repetitive. Luckily there is some more variety in seafood primi, like the risotto I blogged about yesterday. We mostly eat fish on Fridays and Saturdays, as seafood should be eaten as fresh as possible and those are the days I do most of my shopping. So Richard’s post on Cajun Seasoned Grouper Sous-Vide had excellent timing, as I had decided I wanted to prepare fish for dinner, but had no inspiration for something blog-worthy. I didn’t actually prepare the same dish as Richard, as for starters grouper is not available around here. 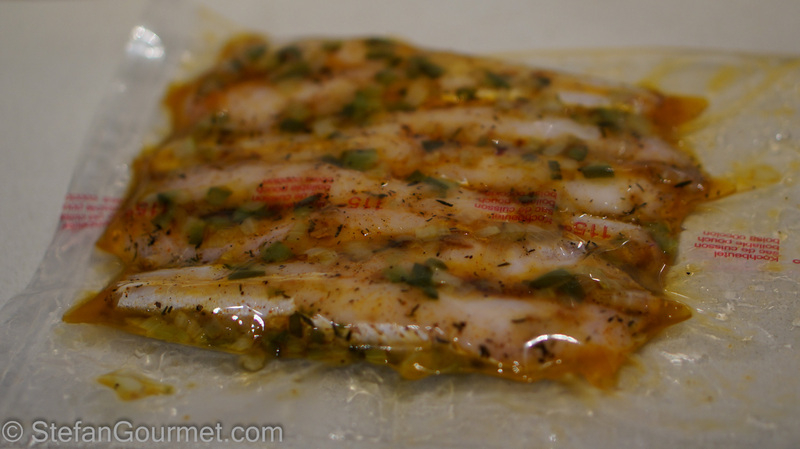 But it did inspire me to come up with a cajun recipe to prepare fish sous-vide. Thanks for the inspiration, Richard! Since I was going to cook the fish sous-vide, I didn’t have to resort to using onion powder and/or garlic powder, but could use fresh onion (since I didn’t have to worry about burning the onion or the onion not sticking to the fish — the vacuum sealing takes care of that). In Italian cooking we often refer to the ‘holy trinity’ of onion, carrot, and celery that is used in many dishes as a basis. In cajun cooking, the holy trinity includes bell pepper instead of carrot. I complemented this holy trinity with a basic cajun spice mix of white pepper, black pepper, cayenne pepper, and dried thyme. 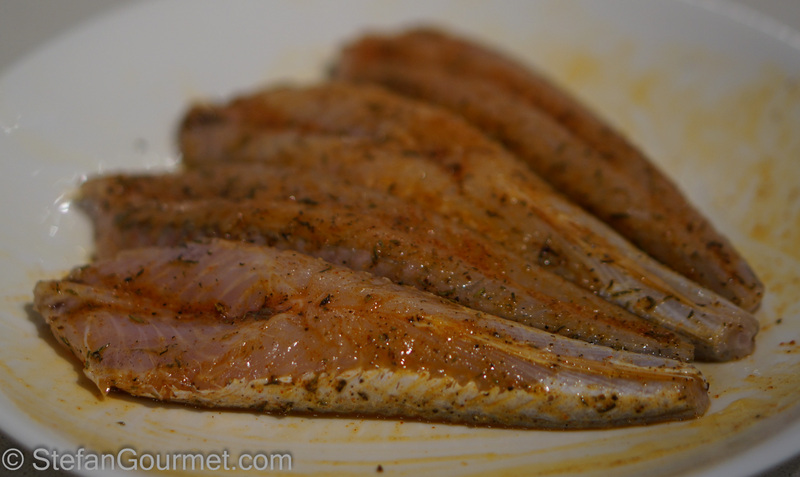 Instead of grouper I used gurnard, which is caught locally and is a white firm-fleshed fish that isn’t as flaky as cod. This recipe will work with any white firm-fleshed fish, also sea bass or snapper would be wonderful. Because the fish is cooked sous-vide, it will be tender and moist without becoming dry. This dish does take about an hour altogether as the holy trinity has to be sautéed and cooled before it is added to the fish to be cooked sous-vide, but a lot of it is idle time. It was well worth the effort and I will definitely prepare fish like this again. The flavors of the holy trinity and the spices worked very well with the fish, which was cooked perfectly. The fish was nicely spicy — if you don’t like it very spicy you may want to use only half the amount of pepper. 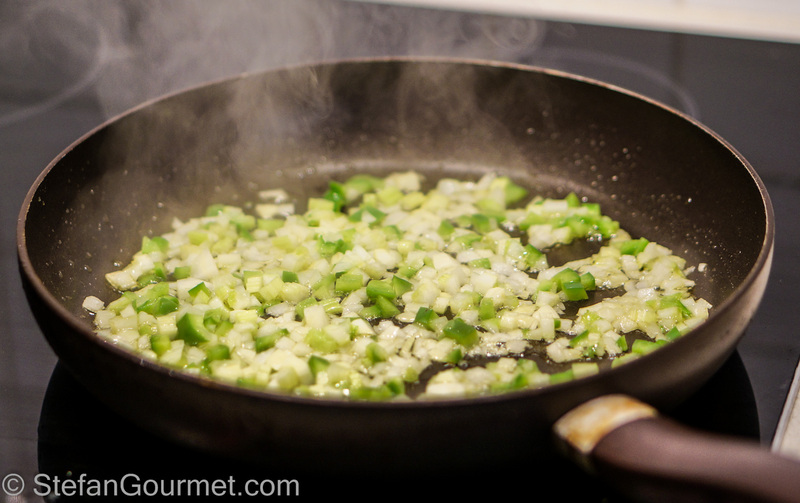 Also, there is not really a need to be as accurate about the amount of onion, celery and bell pepper as indicated in the recipe. If you’ve been following this blog for a while, you may have noticed that I often mention that food should be served on warm plates. This is the number one tip I have for home cooks (and unfortunately also many restaurants): always serve hot food on preheated plates so the food will stay warm for a longer time. The most practical way to preheat your plates is to put them in the oven at 100ºC/210ºF. Higher temperatures can be used, but will cause food that is put on the plate to cook or stick to the plate. Warm plates are even more important if you like to plate the food nicely (so the food doesn’t cool off too much while you are plating), and even more so when you are taking photographs of the food before serving 😉 With this dish it is even more important, as the fish is cooked at 50ºC/122ºF and therefore isn’t very hot to begin with. Heat 2 Tbsp of the oil in a frying pan. Add the holy trinity and sauté over medium-low heat. Sauté the holy trinity until it is soft and fragrant and only slightly golden, about 10 minutes. Allow to cool. 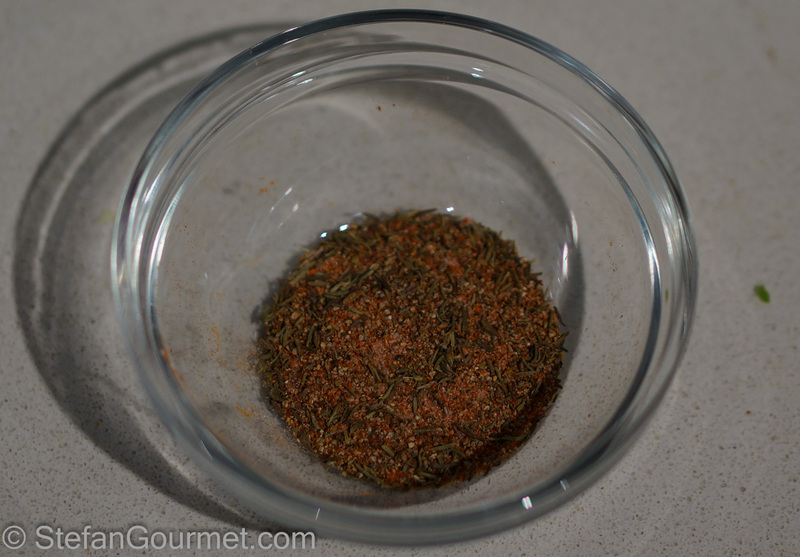 Meanwhile, combine salt, thyme, white pepper, black pepper, and cayenne pepper in a bowl. 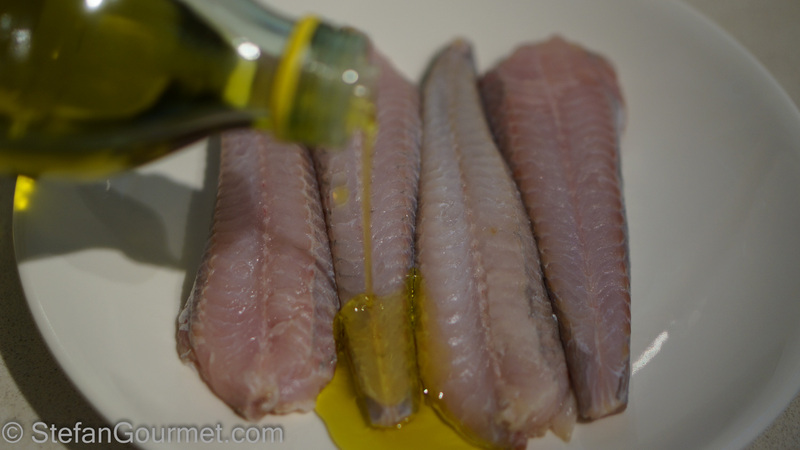 Coat the fish fillets with the remaining 2 Tbsp olive oil. Add the spice mix and coat the fish fillets evenly. 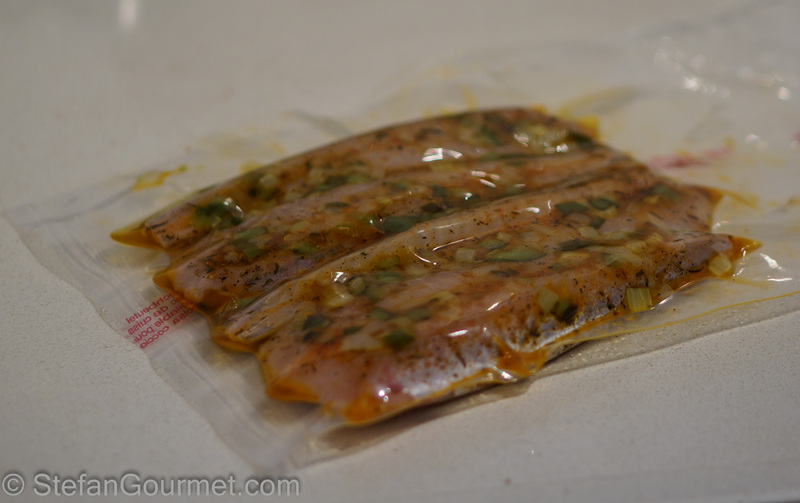 Put the fish fillets into a sous-vide pouch. Distribute the sautéed holy trinity on both sides using a spoon, then vacuum seal. Cook sous-vide for 20 minutes at 50ºC/122ºF. Meanwhile, prepare rice and green beans. Arrange the rice and beans on preheated plates first so you can serve the fish as quickly as possible. 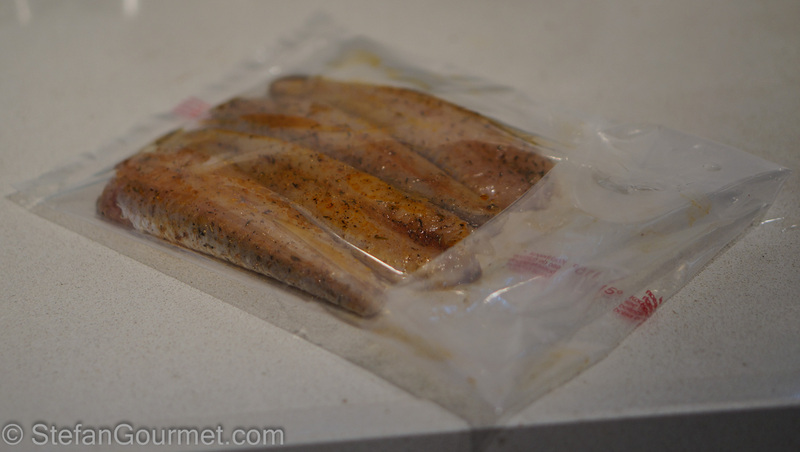 Cut open the sous-vide pouch, carefully transfer the fish fillets to the prepared plates, and spoon over any remaining holy trinity from the bag. 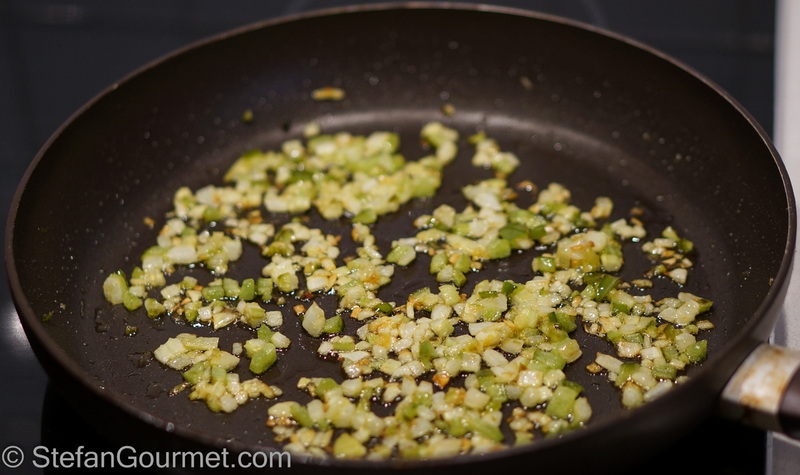 Garnish with parsley and green onions. This is nice with a zesty sauvignon blanc. We enjoyed it with a 2007 Sancerre “La Bourgeoise” from Henri Bourgeois. 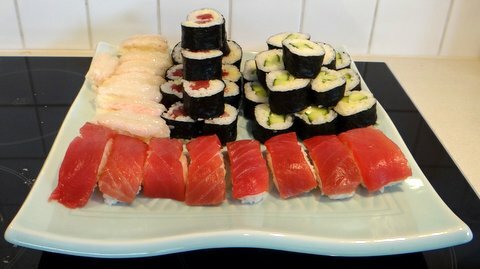 With some practice home-made sushi is not that hard to make and it is not that hard to do a better job than a lot of ready-made sushi, as sushi rice deteriorates quickly as it is refrigerated. If you can find fresh fish, which obviously has to be sushi-grade, then nothing is stopping you. Even if you cannot get sushi-grade fish, you can always make california rolls or cucumber sushi. You will love the result. I read Richard’s post earlier. Funny to see him inspired by your sous vide and you inspired by his Cajun cooking. The warm plates advice is good. We have a ‘fancy’ dining set that simply doesn’t retain heat. Very frustrating. Fun spin on it, Stefan, and it looks delicious. 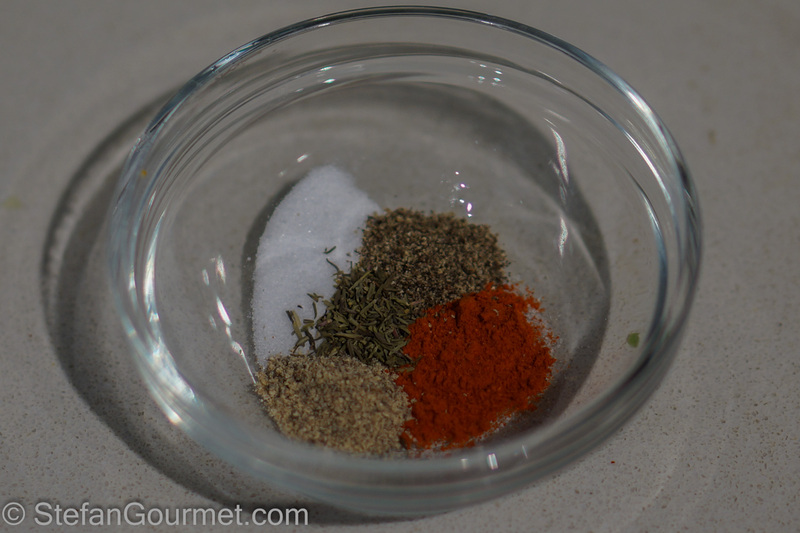 Cajun seasoning provide just enough heat but tons of flavor that compliment, not overpower, the primary protein. I like your using fresh garlic and onions in the sous vide and would expect it to provide a purer flavor. You also get the rich fish flavor from the juices in the sous vide poach. I will definitely give that approach a try the next time. I would really like to try the gurnard but we don’t find it here in DFW. I’m not certain you can find it in the US. I agree. Thanks for visiting and taking the time to comment. Hope to see you again soon! Tried this tonight for dinner and it was delicious! I truly don’t eat fish often because I just don’t (or I should say didn’t?) like it. I’m trying more fish for medical reasons and this was truly what the doctor ordered. I was skeptical about the amount of time and was afraid the fish would be under done. But the texture was wonderful. It is amazing to have fish that is not over cooked! I’ve tried several of your recipes (sous vide) and loved them all. I will definitely have this again and often! I’m going to cook some fish I have sous vide today! I’m going to use these directions for the sous vide part!